While looking through old documents, it is almost inevitable that the reader's attention will be drawn from the intended target to other articles. The reports below were found in old Glasgow Herald newspapers. Although they have no football content, they may be of interest. Mrs Breckenridge, 18 Princes Place, Ardrossan, has received official notice that her son, William Breckenridge, 1-4th Royal Scots Fusiliers, has been admitted to a Cairo hospital suffering from rheumatism. MacGowan - Died suddenly at 9 Montgomerie Street, Ardrossan, on Friday 21 January, 1916, Captain William MacGowan, in his 71st year. Funeral private. The funeral of Captain William McGown, a well-known Glasgow shipmaster took place from his residence, 9 Montgomerie Street, Ardrossan, yesterday. Captain McGown was born in Saltcoats, over seventy years ago, and served his apprenticeship in the Indian trade. He was captain of the clipper Benvenue, owned by Messrs Watson Brothers, Glasgow, when she was wrecked along with the City of Perth by a tidal wave in Timaru Bay, New Zealand in May 1882. His last sailing ship was the Gogoburn, owned by Morris Carswell of Largs. He afterwards transferred his services to Messrs Gow, Harrison and Company of Glasgow and was latterly commodore captain and shore superintendent for the firm in Glasgow. He partially retired a number of years ago, but occasionally acted as marine superintendent. He was a man of considerable mathematical and inventive ability. He was first to have auxiliary engines fitted to a sailing ship and there are numerous successful patents which have been based on his original specifications. He leaves a widow and two sons – Captain William McGown, in command of His Majesty's Australian Ship Gilgan, and Captain A McGown, 18th Battalion Highland Light Infantry. The New Zealand Grey River Argus newspaper reported the following on 11 April 1916. The Ardrossan and Saltcoats Herald, Scotland, records the death, of Captain John McGowan who was in command of the Benvenue which was wrecked at Timaru in 1882. The following is an extract from an obituary notice in the paper named. Captain McGowan took command of the clipper Benvenue, owned by Messrs Watson Brothers, Glasgow, and in this ship made a number of record passages between Scotland and Australia in the wool trade. This vessel was ultimately wrecked by a great gale and tidal wave in Timaru Bay, New Zealand, in 1882. The Timaru disaster is one of the outstanding catastrophes in the annals of shipping. The Benvenue and City of Perth were anchored in the bay when the storm broke and the ships were destroyed. In an attempt to save the crew of the City of Perth, a life boat with the harbourmaster and six men was lost. Captain McGowan succeeded in bringing all his men ashore in his ship's boats. Captain McGowan was a man of wide reading and was possessed of considerable mathematical ability and inventive genius. Only a few days before he passed away he was discussing the usefulness of an edition of Burn's poems, adapted for American readers. He had always the courage of his political convictions and never wavered in his belief in Liberalism. The local organisation will sadly miss his cheery optimism and active co-operation. Memories of Captain McGowan will always conjure up a lovable kindly, warm-hearted townsman. He is survived by a widow and two sons. The elder, Captain William McGowan, is at present in command of His Majesty's Australian Ship, Gilgan, and the younger, Captain Archie McGowan, is serving with the 18th Battalion Highland Light Infantry. The following seven wounded soldiers have been admitted to Ardrossan Red Cross Hospital. 1807, Sapper John McIntosh; 76310 Gunner Sam Wood; 96680 Bombardier James Richardson; 1787 Driver John Corrigan; (9637) Fusilier S White; 1775 Lance Corporal O’Donnell, 1st Newfoundland Regiment and 2073 Robert Speirs, Highland Light Infantry. 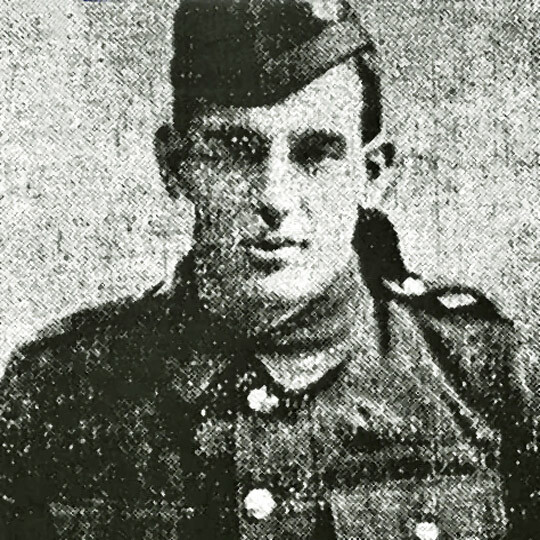 Mrs Cranston, 38 Kilmahew Street, Ardrossan, has been informed that her husband, Thomas Cranston (pictured below), 2nd Black Watch, was killed while serving with the Indian Expeditionary Force. Private Cranston was a well known footballer and at the time of his enlistment was playing for the Clyde Football Club. He was a native of Ardrossan and as a youth played with the Ardrossan Celtic and Ardrossan Winton Rovers. He entered the senior ranks as outside left for the Raith Rovers and the following season played for Third Lanark and afterwards joined the Clyde. He was twenty-three years of age and leaves a widow and one child. Mrs Burns, 2 Kilmahew Street, Ardrossan, will be grateful for any information about her son-in-law, Charles Smith, C Company, 6th Royal Scots Fusiliers, who has been missing in France since 26 September. Perhaps the gentleman who left Ardrossan for Belfast about a month ago and who stated that his brother - a prisoner of war in German - had met Private Smith, will communicate with Mrs Burns. The name, Charles Smith appears on the Ardrossan War Memorial and may refer to Mrs Burns's son-in-law. Ardrossan Women’s Liberal Association held a sale of work in aid of the Red Cross Society’s funds. The sale was opened by Miss Russell of Seafield, and the sum realised was £11 18s. Seaman Thomas Foy, Royal Naval Reserve, aged twenty-four, His Majesty's Trawler Ashlyn, on 10 October 1916, endeavoured to rescue a man, aged fifty, from drowning in the harbour at Ardrossan. Foy was awarded an honorary certificate and the sum of £10. The following have been admitted to Ardrossan Hospital. Ardrossan United Free Presbytery - the Reverend G Buchanan presiding - yesterday agreed to petition the Central Control Board in favour of prohibition during the war. Mr Thomas Blackwood, 67 Kilmahew Street, Ardrossan, has received official intimation that his son, John Blackwood, Royal Highlanders, has been killed in action. Private Blackwood was twenty-one years of age and prior to enlisting was employed as a fireman on the Glasgow and South-Western Railway. The minesweeper Cheltenham, – 245 feet in length and 58 feet in breadth – built by Ardrossan Dry Dock and Shipbuilding Company Limited for The Admiralty, London, was launched on the above date. Killed in action on 7 April, 1916, Private Tom Wallace, Australia, and late of Holmerkollen, Ardrossan. Holmerkollen was the name of a house in South Beach Road, Ardrossan. At the monthly meeting of Ardrossan Town Council, Doctor Allan, medical officer, reported that for the year ending 31 December 1915, the births registered numbered 175, which was equal to a birth rate of 27.3 per 1000 of the population. The deaths numbered 110, equal to a death rate of 16.1 per 1000 of the population, as against a rate of 11.3 for 1914. The death rate for 1915 was the highest recorded for many years. The infantile mortality rate was 10.7 per 1000 births. Mr Walker, 1 Church Place, Ardrossan, has received intimation that his son, Archibald Walker, Gordon Highlanders, has been killed in action. Private Walker, who was an apprentice engineer, enlisted in October 1914. Musselburgh Town Council last night accepted the proffered gift by Mr G L Bailey, Ardrossan, of the presentation portrait in oils of Town Clerk Thomson of Musselburgh who held office between 1813 and 1844. The donor’s late father, Mr James Lambert Bailey, solicitor and bank agent, Ardrossan, had been apprentice with Town Clerk Thomson. Information has been received by friends in Ardrossan that Second Lieutenant Thomas Cartmell, Lancashire Fusiliers, has died from wounds received in action. Lieutenant Cartmell, prior to joining the army, was engaged in the Customs Department at Ardrossan. He was also at one time in the Grangemouth collection and for a brief period stationed in Glasgow. He was a member of the Civil Service Rifles and was called up in August, 1914. He saw a considerable amount of service in France and was twice wounded. At the beginning of this year, he was recommended for a commission and was gazetted to the Lancashire Fusiliers. He was a native of St Annes-on-Sea, Lancashire, where his parents reside. A body floating in Eglinton Dock, Ardrossan, has been identified as that of William Watt, smelter worker, Harbour Street, Irvine. He had in his possession a ticket for Belfast and it is assumed he fell into the dock while making for the steamer. It has been ascertained that the correct name and designation of the man drowned at Ardrosssan Harbour was William Kelso, labourer, Irvine.